This page is all about the town of Alicante on the Costa Blanca coast of Spain. 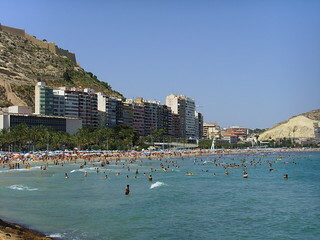 It contains useful Alicante tourist information for people intending to visit or holiday in Alicante. In this tourist guide to the tourist resort of the city of Alicante the gateway to the Costa Blanca of Spain we help visitors who are planning a trip with useful and practical advice on many tourism related subjects such as car hire, accommodation, apartment rental, villa rental, hotels, hostels, map, sightseeing, weather, where to go, where to stay, travel information and what to see and do in Alicante. To make the best of your visit and holiday we cover everything you need to know about Alicante. We also have photos, picture galleries, views, videos and Alicante webcams of Alicante. Alicante is a very well-known city primarily because of Alicante airport through which many of the visitors to the Costa Blanca arrive. Alicante has one of the three international airports that service the Costa Blanca. El Altet now has a new terminal and is being upgraded to not just being able to offer international European flights but also long-haul flights to the Americas. Alicante is also the capital of the Costa Blanca although it has quite a small population of approximately 300,000. Strangely enough, most people arrive at Alicante airport and then head out of Alicante at the first opportunity, strange because there are many attractions of the city in particular Alicante has some of the finest beaches in the whole of the Costa Blanca. Alicante is the busiest of the three hubs on the Costa Blanca, Valencia Airport, Murcia Airport and Alicante Airport provides the gateway for tourists and locals arriving on the Costa Blanca. Of these three airports Alicante Airport is the busiest owing to the diversity of flights, destinations and carriers it has on offer. El Altet is located twelve kilometres or eight miles to the south of the city, and although the city of Alicante is not known as a tourist destination in itself, the city does have a lot to offer in terms of beaches, shopping, bars, restaurants, pubs, nightlife, excursions, monuments, museums, parks, as well as good selection of city hotels in all categories and to suit all budgets. There is a regular bus service going to downtown Alicante every twenty minutes. The C6 will take people who want to catch the train further afield directly to the train station, bus station for those wanting to catch buses to places such as Benidorm, and the tram station which connects people to some of the smaller sea side resorts as well. The journey time takes approximately forty minutes at a cost of €3. This is the easiest and fastest way to get to Alicante but not the cheapest. The journey time from Alicante Airport to Downtown Alicante is about fifteen minutes depending on traffic. You can expect to pay €14 for a day fare and if arriving at the Alicante Airport late at night or during a fiesta you can expect to pay €16 for a party of four. You can book a taxi in advance on www.radiotaxielche.com. At this moment in time there is no train station at Alicante Airport itself and tourists who want to catch a train to the sea side resorts on the Northern Costa Blanca can take a taxi or catch the C6 bus to the train station in Alicante to be able to travel by train further afield. There are many shuttle service companies providing transfers from Alicante Airport to Downtown Alicante. The most popular shuttle companies offering competitive rates include Resort Hoppa and Shuttle Direct. A private transfer with Shuttle Direct costs €10 per person one way for a party of four. This kind of transfer is much like a taxi service with the exception that the transfer is pre booked with the option of using the shuttle service as well on the day of departure. Most people don’t hire a car at Alicante Airport to visit the city of Alicante, but all the major car companies are represented at Alicante Airport and you can compare companies to get the cheapest quote. Costs of hiring a car are dependent on the time of year, model and duration of the rental period. The journey time of course would also be approximately an hour. As Alicante Airport is so close to the city centre it is up to the individual to either catch the airport bus which is the cheapest, or catch a taxi or even book a private transfer. Some holidaymakers who arrive on late flights at Alicante Airport do check into the city hotels before travelling further to the villas and apartments which they have booked and find that owing to the late hour that a taxi ride is the best option for them. Alicante promenade is also worthy of note. The ‘Explanada de Espana” is lined with palm trees and a great place for a walk in the evening as many Spanish families do. Also worthy of note is Alicante castle which overlooks the city and surrounding area providing spectacular views. The castle dates from the sixteenth century and is well-preserved. 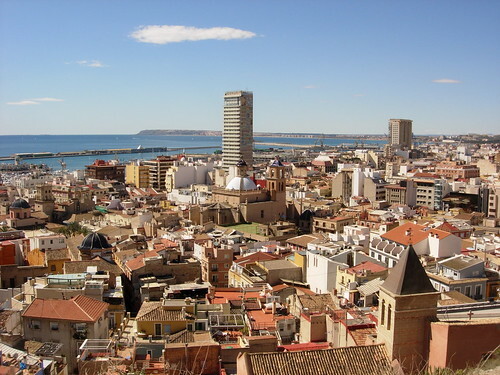 Alicante is the hub of the Costa Blanca. It neatly divides the Costa Blanca into two zones. The northern Costa Blanca which reaches Denia in the north, to Orihuela in the south. Alicante is classed as one of the most healthy cities in the world with over 320 days of sunshine a year. Alicante has a diverse population from the North-African Moroccans to the South-Americans, Spanish as well as a steady influx of tourists. The busy marina and harbour offers ferry destinations to Alger and Oran in Algeria. Alicante has what is known as a Mediterranean climate which means long hot summers with very little or no rainfall, and cool sometimes wet winters. Alicante is known for the Santa Barbara castle, the Santa Barbara Castle is one of the largest medieval fortresses in Europe with far reaching views across the city. It has many green areas, famous promenades and a beautiful marina. The most famous promenade in Alicante is known as the La Explanada de España. 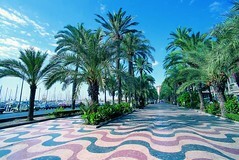 It stretches around the marina, this elegant boulevard with its 6.6 million red, black and cream tiles. Make sure you visit the local market selling fresh fruits and vegetables as well as other locally-made goods and produce – market day in Alicante is on a Tuesday and Thursday. The best way to see Alicante is with the Turibus. Alicante is a very busy city with heavy traffic and getting around the city by car can be a daunting experience. The Turibus tours the city from 10am until 2pm and then from 5pm until 7pm and has an eighty passenger capacity. A ticket costs only €8 (€5 for kids and pensioners) and is valid all day so you can hop on and off as many times as you like. 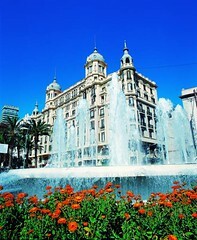 The bus stops at all the popular tourist attractions such as the Plaza del Mar, Archaeological Museum, Sta Barbabra Castle, Central Market, Luceros, Renfe Station, Maisonnave (the shopping area), the Theatre and the Rambla. Alicante is also blessed with many beautiful beaches. Here is a list of the most popular ones. Playa Postiguet is within walking distance from the town center, this beach is popular all year round both with locals and with visitors. The promenade goes along the full length of the long beach and is flanked by palm trees. Good facilities, golden sand, life guards, beach bars and nearby restaurants. Playa La Albufereta is a picturesque small bay a couple of miles up the coast from the Playa Postiguet. It has white, fine sand, a beach bar, life guard in high season, and offers water sports and leisure platform. Very near main road. The Cala de la Palmera and Cala Cantalars both form part of the Cabo Huertas rocky cape which reaches out into the deep blue Mediterranean sea, it has crystal clear water, ideal for snorkelling, but no services. Family-friendliest in the summer months. The Playa de San Juan is Alicante’s longest and best beach, stretching along for more than seven kilometers of fine white sand it has excellent facilities, life guards during the summer months. It has beach bars, restaurants along its long promenade and a play area for children. This beach is very popular during the summer months so come early. Just north of San Juan there is the Playa Muchavista which offers the same services and facilities but isn’t as busy in the summer months. El Campello’s main beach is the Playa Carrer La Mar consisting of small bays with both pebbles and sand. It has a lovely promenade with bars and restaurants. Ideal for families it also has a play area. The Playa Almadrava is a small sand and pebble beach with no services, life guards or facilities. The Playa Agua Amarga is situated on the southern side of Alicante and can be seen from the coastal road linking Alicante and the airport. The Playa Urbanova on the south side of Alicante is framed by apartment complexes and has all the facilities and services. This beach becomes very busy during the summer months and is frequented by the locals and tourists. The Playa Arenales del Sol is one of Alicante’s finest beaches has dunes and fine white sand is popular with young people with many bars and restaurants close by. Address: Avenida Rambla Mendez Nuñez 41, 03002, Alicante. Opening Hours: Monday to Friday from 9:00 to 20:00 h. Saturdays from 10:00 to 20:00 h. Sundays and holidays from 10:00 to 14:00 h.
Address: Aeropuerto Alicante (Terminal Llegadas T1 L’Altet). 03195. Alicante – Alacant. Opening Hours/Times: January Hours: Closed Mondays except Monday 21 (open from 09:00 to 16:00 h.) Tuesday, from 09:00 to 19:00 h. Wednesday, Thursday and Friday from 9:00 to 16:00 h. Saturdays from 9:00 to 14:00 h. exc. Saturday 19, closed. Sunday and Jan. 1, closed. Address: Avenida Salamanca s/n (Junto a la Estación de Ferrocarril), 03005, Alicante-Alacant. Opening Times: Monday to Friday, 09:00 to 14:00. and from 16:15 to 18:30 h. Saturdays from 10:00 to 14:00 h.
Alicante Tourist Office (Centro) Address: Calle Portugal 17 (Estación Autobuses), 03003, Alicante-Alacant. Opening Times: Monday to Friday, 09:00 to 14:00. Address: Avenida Explanada de España 1, Edificio Carbonell, 03002, Alicante-Alacant. Address: Soc. Relaciones Intern. Campus San Vte. Raspeig. 03080. Sant Vicent del Raspeig. Page Summary – This page contains unique content about the beach resort of Alicante, a popular tourist destination on the Costa Blanca coast of Spain. Thank You very much for this excellent information ,looking forward to an excellent stay in Alicante and will be homebase for my wife an I . Looking forward to this wonderful trip as it is our first trip to Europe and will begin in Spain and will end in Spain. Again Thank You.